Reaper just keeps going up and up in their funding and that means more and more models for you. Here's a look at their next goal level at $405k. You have all done an amazing job! Mr. Bones has stirred up the angry spirits! 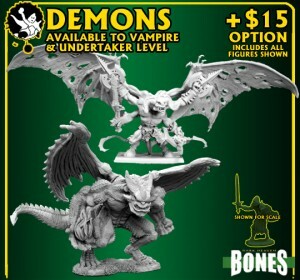 Now, Vampire and Undertaker level backers will receive these 4 "medium" and one "large" spectral haunt figures – made in translucent green plastic, automatically as a part of their pledge! That's 111 miniatures for Vampires!